Renaming a Parameter in iChart - NexSens Technology Inc.
iChart software allows users to update the names of sites, data loggers, sensors, and parameters after they have been added in the Setup Device Wizard. 1. Open iChart with a current project. 2. 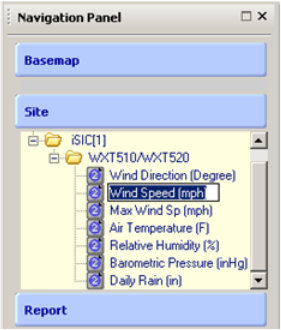 Slowly double click the desired Site, Data Logger, Sensor, or Parameter in the Navigation Panel. This highlights the name for editing. 4. Type in the new name and click away on the screen for the change to take effect. Note: If a parameter is being renamed, do not alter the characters in the parentheses after the parameter name, as they indicate the display units of the parameter. Note: When changing a parameter name, right-clicking on the parameter will also allow name changes. It is important that the full name and abbreviated name be filled in with something. 5. Click the Save button and close the iChart project file. Reopen the project file to confirm that the update was successful. Note: It is important to save and close the iChart project file each time a name is changed. If multiple names are being changed, save and close the project between each change. This reduces the potential for corruption of the project file. If the project file becomes corrupted, click here for instructions on recovering a backup .icr file.